Starting At $1,295.00 + Free Shipping! The aeris GmbH 3Dee Active Office Chair is the first of its kind! Its 3D design allows for horizontal, vertical and forward tilt movement which keeps you in motion while at your workspace. This extra activity will give you more energy, help your posture, and can even improve your health; plus it’s simply a lot of fun to use! Not only will the 3Dee help you feel great, it will look great in your office too; it is available with red or black microfiber upholstery and your choice of black or polished chrome springs. Motivated: The patented 3D Technology , comprising the unique 3D movable joint in the base and the spring strut, supports and encourages harmonious 3D movement. This stimulates your circulation, strengthens core muscles, enhances concentration and is just fun! Relaxed: The backrest with patented lamellar technology and physiologically shaped backrest cushioning provides support without restricting freedom of movement. 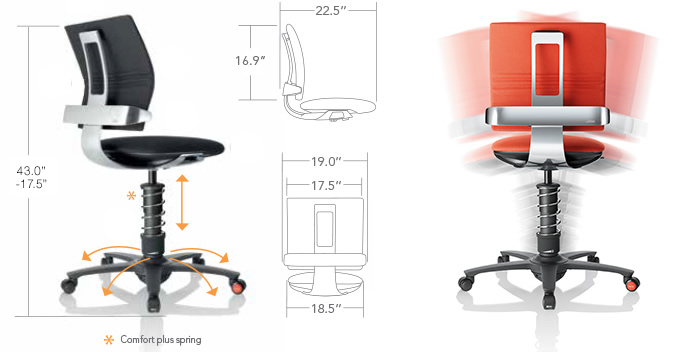 The lumbar support and backrest tension can be individually adjusted. Unrestricted: The intelligent seat is slightly convex, upholstered with breathable multi-zone integral foam and equipped with the flexzone® technology . For a healthy seat climate and optimum sitting comfort without pressure points.